Filmed over the course of 12 years with the same cast is a groundbreaking story of growing up as seen through the eyes of a child named Mason. A box office hit from IFC Films that has garnered universal critical acclaim The film stars Ethan Hawke, Patricia Arquette, Lorelei Linklater and Ellar Coltrane as Mason. HOLLYWOOD, Calif. - Hailed as "a moving 12-year epic that isn't quite like anything else in the history of cinema" (Andrew O'Hehir, Salon), "a breathtaking achievement" (Ann Hornaday, The Washington Post) and "a profound viewing experience" (Manohla Dargis, The New York Times), writer/director Richard Linklater's extraordinary film Boyhood debuts on Blu-ray Combo Pack and DVD January 6, 2015 from Paramount Home Media Distribution. The film arrives four weeks early on Digital HD December 9, 2014. Filmed over the course of 12 years with the same cast, Boyhood is a groundbreaking story of growing up as seen through the eyes of a child named Mason. A box office hit from IFC Films that has garnered universal critical acclaim, Boyhood achieved a rare 99% Certified Fresh rating on Rotten Tomatoes, earned an unprecedented score of 100 on Metacritic and is the first film to receive an A+ score from Entertainment Weekly's Critical Mass. The film stars Academy Award(R) nominee* Ethan Hawke, Patricia Arquette, Lorelei Linklater and Ellar Coltrane as Mason. The Boyhood Blu-ray Combo Pack includes a look at the extraordinary work that went into making the film, as well as an in-depth Q&A with Richard Linklater and the cast. The Blu-ray Combo Pack available for purchase includes a Digital Version of the film that can be accessed through UltraViolet(TM), a way to collect, access and enjoy movies. With UltraViolet, consumers can add movies to their digital collection in the cloud, and then stream or download them--reliably and securely--to a variety of devices. 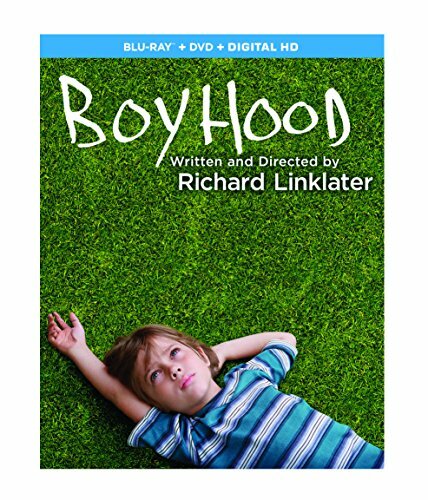 The Boyhood DVD is presented in widescreen enhanced for 16:9 televisions with English 5.1 Dolby Digital, Spanish 5.1 Dolby Digital and English Audio Description and English and Spanish subtitles. The DVD includes the feature film in standard definition. Paramount Home Media Distribution (PHMD) is part of Paramount Pictures Corporation (PPC), a global producer and distributor of filmed entertainment. PPC is a unit of Viacom (NASDAQ: VIAB, VIA), a leading content company with prominent and respected film, television and digital entertainment brands. The PHMD division oversees PPC's home entertainment, digital and television distribution activities worldwide. The division is responsible for the sales, marketing and distribution of home entertainment content on behalf of Paramount Pictures, Paramount Animation, Paramount Vantage, Paramount Classics, Insurge Pictures, MTV, Nickelodeon, Comedy Central and CBS and applicable licensing and servicing of certain DreamWorks Animation titles. PHMD additionally manages global licensing of studio content and distribution across worldwide digital and television distribution platforms including online, mobile and portable devices and emerging technologies. "ACADEMY AWARD(R)" is a registered trademark and service mark of the Academy of Motion Picture Arts and Sciences.